Alphonso Bow directed by Lije Sarki from a screenplay by M. Sarki follows the titular character and his friend Frank as they eat lunch in a restaurant. The restaurant is the primary location in the film, and unfolds in “real-time” as the conversation takes place. 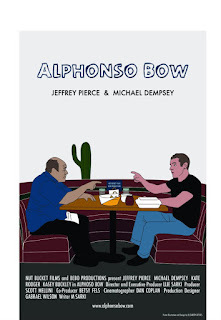 Jeffrey Pierce plays Alphonso with motor mouth precision and Michael Dempsey plays Frank his friend who meets up for lunch. During the course of the conversation, the pair (primarily due to Alphonso) annoys and offends patrons and wait staff alike. The conversation veers from the existence of aliens, to relationships, what kind of food is good, work and more. The film is a examination of conversation, and as such, the film is rich in dialog. Alphonso talks the most and gets some great laughs. While Dempsey’s work as Frank isn’t as flashy as Pierce's, like any good duo, the quiet member is often the one who holds the group together. Frank’s reactions, goading and honest inquiries make this conversation rich, and although it is lop-sided in terms of who gets more lines, this film would not work without a good Frank and Dempsey was perfect in this role. This film is recommended if you can seek it out. Somewhere between comedy and drama, the film focuses on dialog when so many films gloss over it. The film can get a little tedious from time to time, as a 70 minute movie revolving around one conversation might do, but smart camera movements and interjections from secondary characters keep the film lively. If you are open minded enough to want to try the film, you will find a rich and enjoyable experience. The version screened at the Detroit Independent Film Festival was in black and white, although the trailer is in color. During a Q&A with the director after the screening it was suggested that film might still be tweaked here and there. I can’t imagine the film would undergo any major tonal changes, with the exception of color being restored. I figured I should mention this in the off chance the film I saw was not the final cut.